NC GreenPower uses your contribution to secure either renewable energy generation or carbon offset mitigation. We work with generators of solar energy, wind power, small-scale hydro power, biomass energy and carbon offsets in almost all 100 counties in our state. How can I help support generators? For every $25 that is donated, you support either 625 kilowatt hours of renewable energy that is shared on the electric grid here in North Carolina, or 6,250 pounds of greenhouse gases that were mitigated, such as captured methane from a covered hog waste lagoon. Want to calculate your donation’s environmental impact? Visit our impact calculator here. Renewable energy or “green power” is defined as energy that consists of electricity provided from solar, wind, small hydro, landfill methane, animal waste methane, agricultural waste and/or other biomass resources. Contributions to NC GreenPower have made projects like these possible. 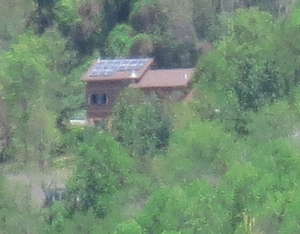 The installation of the renewable energy system was funded by the project owner. This generator project is grid-tied and interconnected with their electric utility. The utility compensates the producer for the electricity generated to the grid, and NC GreenPower provides additional incentives for the green attributes (or RECs) for each kilowatt hour added to the grid.